When asked what it was about the brand and, particularly, the Muse 210LA that appealed to him, Dwinga cited durability, a precise rigging readout system that allows him to get the exact angle he needs for a given event, and exceptional sound throw. 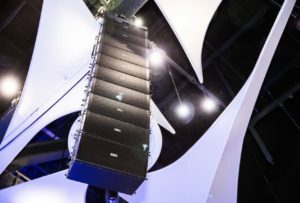 He also touted its sound quality, calling it “one of the flattest boxes [he’s] ever heard in a line array.” The equipment’s sleek, attractive and functional design was also named as an outstanding feature. Customer service, though, topped the list when the business owner was asked about John Krupa, President of Italian Speaker Imports, the exclusive U.S. distributor of FBT. Dwinga, who says he tries to model his own business and personal life with that same integrity, said that his first exposure to FBT surprised him just as much as his engineer was at their recent large-scale event.